Legendary comedian, actor, singer and a renowned film, stage and television star Moin Akhtar passed away in Karachi on Friday. He died at age 61 as a result of heart complications, leaving behind a wife, three daughters and two sons. Moin Akhtar was truly a legend and an icon in Pakistan's entertainment industry. He started his career at the age of 16 with a comedy show on a Pakistan television screen and moved on big time as a seasoned and most sought after comedian and performer. He played legendary roles in several comedy sitcoms that are truly classics and will be remembered for many years to come. He ruled on television screen for several years. He performed with legends including Bushra Ansari, Anwar Maqsood and many other renowned artists from Pakistan TV and Silver screen. He hosted several Bollywood concerts with Bollywood legendary actresses including legendary Rekha and performed in many Bollywood shows. 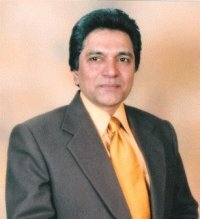 Moin Akhtar was a television, film and stage actor, as well as a comedian, and a host. He was also a play writer, singer, film director and a producer. He was one of the most sought after actors and performers both in Pakistan and globally in entertainment industry. He was fluent in several languages, including English, Bengali, Sindhi, Punjabi, Memon, Pushto, Gujarati. Some of his famous TV series included Roozi, Dollar Man, Makaan no 47, Half Plate, Family-93, Bandar Road say Kimari and many other legendary plays and sitcoms. His most memorable performances as different personalities were in a comedy talk show Lose Talk which ended after 400 episodes. Moin Akhtar was born in December 24 1950. He was awarded the Pride of Performance and Sitara-e-Imtiaz awards by the Government of Pakistan. His TV debut was on September 6, 1966, in a variety show held to celebrate first defense day of Pakistan‎. He is a great artist belongs to Karachi a famous city of Pakistan and has starred in many TV dramas and live comedy events. He is rated among top artists in Pakistan. In 2005 he started work on talk show Loose Talk, in which he appears as a disguised guest every time and is interviewed humorously by writer Anwar Maqsood. Loose Talk airs on ARY Digital. He hosted "The Moin Akhtar Show" on PTV where he used to have celebrities come on the show with their spouses and have them answer questions, and also starred in the Television play, Rosi, which gained much fame because of Moin Akhtar's notable performance. Rosi was inspired by Tootsie and Moin Akhtar was the counterpart of Dustin Hoffman. He is one of the most versatile actors ever to enlighten the Pakistani television. His wit and humor keep the audience glued to the screen and while he says even the most impossible things, his sugar coated words along with his boyish charm make him one of the most unique actors in the business. Moin Akhtar is an inspiration for all the generations to come and one of the few that stand out among the many. He has parodied in several languages, including English, Sindhi, Punjabi, Memon, Pushto, Gujarati, bengali and others, while in the Urdu-speaking world, he is beloved for providing great humor for people of all ages, and with an etiquette that remains unmatched. He was the host of the show in which King Husain of Jordan was invited. He was the host of the show in which the Prime minister of Gambia, Dawoodi-Al-Joza, was invited. He was the host of the show in which President Zia-ul-Haq was invited. He was the host of the show in which Prime Minister Zulfiqar Ali Bhutto was invited. He was the host of the show in which President General Yahya Khan was invited. He was the host of the show in which President Ghulam Ishaq Khan was invited. He will truly be missed by all his fans worldwide. May his soul rest in peace in heaven, for more about Moin Khan death.